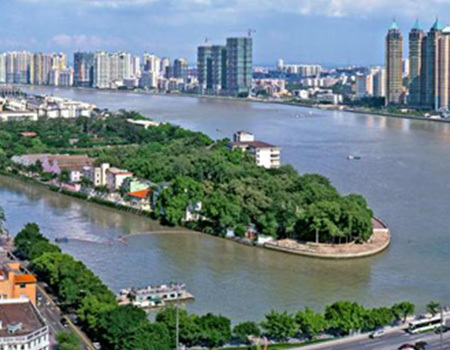 Guangzhou is leading China’s efforts in urban innovation and sustainability. Click to enlarge. Joslyn Institute for Sustainable Communities’ President & CEO W. Cecil Steward and Vice President Sharon Kuska were keynote speakers at Future Juneau on April 26 and 27 in Juneau, Alaska. 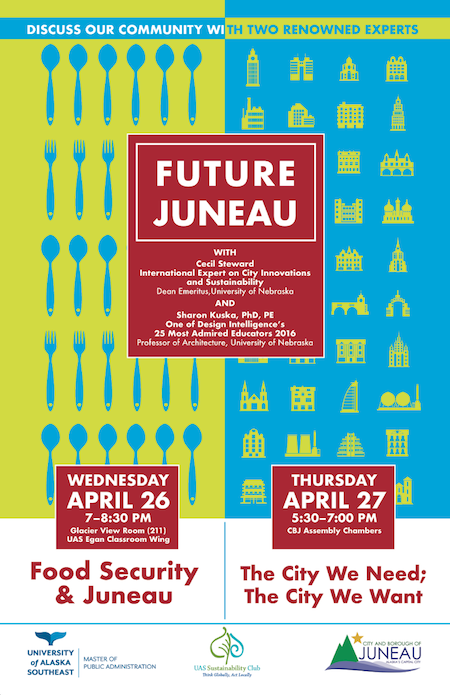 Future Juneau, a two-night event, featured innovation and sustainability expert Steward and Dr. Kuska, an architecture and design expert. The first presentation on Wednesday, April 26, “Food Security & Juneau,” focused on the importance of local foods, availability, food security and challenges and opportunities for Juneau in creating local food sources. The second presentation took place at the City Chambers and focused on “The City We Need; The City We Want.” Steward and Kuska’s talk centered around the New Urban Agenda, as defined at Habitat III last year, UN-Habitat’s global conference. The Joslyn Institute, along with University of Alaska Southeast’s Jim Powell, was a key contributor to defining the New Urban Agenda during its Urban Thinkers Campus in November 2015. Both Kuska and Steward are from the University of Nebraska. Kuska is an architecture professor, while Steward is a Dean Emeritus. Kuska was named one of Design Intelligence’s 25 Most Admired Educators of 2016. The UAS School of Management and the UAS Sustainability Club hosted the events. In the quest for solutions to such critical issues as global warming, population growth and migration, gender and income equality, cities are fast becoming the vanguard around the world. The third biennial Guangzhou International Award for Urban Innovation recognized the important contributions cities are making to sustainable development. The Joslyn Institute’s President and CEO W. Cecil Steward was one of the jurors for the award, the second time he has done so. Given the highly centralized and/or bureaucratic nature of national governments around the world, Steward said, it is cities necessarily that are being increasingly nimble and innovative in the face of urgent challenges caused by climate change, population growth and migration and demands on resources. The projects are all scaleable, transferable and inclusive. The consensus among the jurors at Guangzhou is that mayors, he said, are much more understanding of these issues and more ready to take them on. Songpa built publicly owned solar power plants that share the profits both within and outside the community. One-quarter of the profits go to poor and vulnerable groups and helps pay for energy-efficient lighting or appliances. The rest of the profits are reinvested in new or existing plants, and also to bring renewable power to developing countries such as Mongolia and Vietnam. As part of Greater Cairo, Qalyubeya has seen rapid urban population growth, which has brought on an increase in informal housing and greater inequality. The municipal government realized that the “Zabaleen” — informal waste pickers — were essential to manage the escalating volumes of garbage produced by the city. A team was set up to work with the Zabaleen to develop a series of efficient and ecologically aware waste-disposal companies. The Zabaleen now use more efficient motorized tricycles, which navigate the narrow streets and bring the trash to a newly constructed transfer station. The municipality, in turn, converts the waste to fuel for sale. The system has created employment for the 20,000 previously ostracized and impoverished Zabaleen while helping to improve the environmental condition of the city. The intense impact of heavy rains in 2011 drew the attention of Copenhagen leaders to the need for focused attention on climate risk. The Copenhagen Adaptation Plan builds neighborhood resilience and improves urban life for the pilot neighborhood’s 24,000 residents. With substantial citizen input, the resilience project focuses on “green” strategies to prevent flooding, such as rain gardens, tree planting and biodiversity — solutions seen as scale-able to city level and offering prospective learning for other cities. Boston’s breakthrough effort to engage young people in actual city decision making—allocating $1 million a year in city infrastructure funds—is the first of the Guangzhou Awards to be recognized two times. The first win in 2014 focused on the uniqueness of Boston’s effort to stimulate interest among youth in civic affairs and to educate future city leaders. Now an extensive network of partnerships has been created with youth-serving agencies, universities and schools. Other advances include engaging children as young as 12, as well as the homeless and youth involved in gangs or in detention centers. National and international partnerships are being forged with other cities such as Baku, Azerbaijan. In La Paz, at-risk youth are candidates for gangs. Now, some of them are paid a minimum wage to become “citizen educators” by dressing up in zebra costumes at traffic intersections. (It’s a play on the term “zebra crossing” — striped areas where pedestrians cross the street.) As described by its supporters, the program’s aim is also to change both driver and pedestrian behavior and to encourage both groups to obey traffic signs and rules.But the larger payoff is to give young people who might otherwise head into lives of crime a reason to be on the side of the law, and to encourage others to respect rules and order—a potentially life-altering experience. The initiative’s simplicity, transferability and social impact has spread to other cities in Latin America. Joslyn Institute President and CEO W. Cecil Steward was a keynote speaker at the Guangzhou International Award for Urban Innovation ceremony on November 16. More than 1.4 billion people live in large cities today, and that number is expected to nearly double in the next 20 years. The majority of these cities are located within or near coastal areas, Steward said. This increased urbanization of Earth’s inhabitants creates unique and complex challenges that organizations such as the Joslyn Institute for Sustainable Communities (JISC), the United Nations’ Human Settlements Program (UN–Habitat), Metropolis Association and United Cities and Local Governments (UCLG), among others, are addressing now. Global warming, housing, infrastructure, poverty, crime, transportation, energy and water resources and other issues are among those faced by densely populated urban areas. At the same time, our cities with their rapidly changing populations, are, more than ever, hubs of creativity and an engine for sustainable growth. To that end, the Guangzhou International Urban Innovation Conference and Awards were established. Sustainability, resiliency, social and economic integration, and forward-thinking governance are among the aims of the conference. “Chaotic urban growth strongly restrains economic development, increases urban insecurity, contributes to the segregation of vulnerable segments of the population, and leads to the loss of natural and historical heritage,” said Steward. “Today,” he said, “the need for coordinated, holistic, visionary, and sustainable management of the cities of the world has never been more critical.” Growing economic and social inequities are a by-product of burgeoning urban growth, and expenses of development and maintenance become inflated as well. Meanwhile, resources become strained. The principles of sustainable urban design, when practiced, help to generate cities that are ecologically sustainable—reducing energy consumption and emphasizing infill and reconstruction; socially sustainable—by promoting mental, physical and cultural health; economically sustainable—by emphasizing conservation-based industry and commerce, rather than consumption-based; technologically sustainable—by promotion of applied and affordable technologies, locally-produced and recognized for innovation; and distinguished by good, equitable governance that engages local residents and stakeholders. Steward said that the Guangzhou International Award for Urban Innovation will, as one of its goals, help to promulgate communications about best practices for urban sustainability. Nicholas You, a member of the JISC Board of Directors, also spoke at the conference. He provided a wealth of examples of innovative policies and practices for urban areas worldwide. The 7th International Meeting of the UN HABITAT Steering Committee for the World Urban Campaign for Sustainable Cities will meet in Marseilles, France,, March 12–14, 2012. Sharon Kuska and W. Cecil Steward, of the Joslyn Institute, will be meeting with the other members of both the Steering Committee and the WUC Standing Committee, and the UN HABITAT Secretariat. JISC is a member of the Standing (Governing) Committee, representing Academic and University interests in the World Urban Campaign. W. Cecil Steward, President and CEO of the Joslyn Institute, is a designated member of an expert team of consultants invited by the UN HABITAT to review and comment on the E’erguna District’s Plan for development of an EcoCity with Net Zero Carbon Emissions, and protections for the largest wetlands in Asia. Steward will spend four days in E’erguna in Mongolia during March to consult on the proect. Click here to view a PDF of a synopsis of the project. W. Cecil Steward and Sharon S. Baum Kuska will be featured speakers at DECON11, the Building Materials Reuse Association’s biannual international conference on deconstruction and reuse on May 15–18 in New Haven. Steward is founder, President and CEO of the Joslyn Institute for Sustainable Communities. A professor of architecture at UNL, Kuska is Vice President of the Joslyn Institute. Steward and Kuska will speak on Expanding the Community Value of a Deconstruction and Second-Use Materials Store: Catching the Wave of the New Green Economy. The presentation will be based on their experience in creating the Eco Products and Services Center, Nebraska Center for Sustainable Construction, EcoStores Nebraska, and DeConstruct Nebraska in Lincoln. These initiatives, under the aegis of the Joslyn Institute for Sustainable Communities, have created and built on a growing regional demand for sustainably building and deconstructing buildings and recycling and reusing those deconstructed materials, among other things. An abstract of the presentation is available as a Word document. Download it here. Or, you can download the PowerPoint presentation (73 mb) by clicking here. The DECON11 conference will take place at various sites around the city, including Yale University and the Gateway Community College. Attendees from around the world will participate in sessions on Sustainable Cities, Deconstruction, Materials Reuse, and Construction and Demolition Recycling. W. Cecil Steward will be the featured speaker at the ASEAN Dialogues Conference in Jakarta April 10 and 11, 2011. Steward, along with Dr. Sharon Kuska, will give a presentation with a focus on the global imperatives for planning for and measuring sustainability. ASEAN is the Association of Southeast Asian Nations, an organization formed in 1967 To accelerate the economic growth, social progress, cultural development, peace, stability, and conservation and sustainable development of the natural resources in the region. The new World Urban Campaign. Steward will provide program and networking information on the plans for the WUC over the coming three years, especially focusing on UN Habitat mission for the WUC, the 100 Cities Program, and benefits in participation. W. Cecil Steward and the Joslyn Institute for Sustainable Communities were elected to an 11-member Standing Committee to assist in guiding the World Urban Campaign for Sustainable Cities, an initiative of the United Nations Habitat agency, in a meeting of the Steering Committee. The Steering Committee is comprised of approximately 70 business, academic, and NGO partners with the UN Habitat to bring global attention and opportunities to cities around the world for enhancing the quality of urban dweller lives and to assist the cities with progress toward conditions of sustainability. W. Cecil Steward was invited to evaluate the 25 major buildings comprising the U.S. Capitol Complex including the Capitol building, the House and Senate office building, the Supreme Court, the Library of Congress, the U.S. Botanic Gardens and other support facilities. The ultimate goal of the AOC is to learn about state-of-the-art methods and technologies for enhancing the sustainability of its facilities and surrounding grounds. Also under expert review will be a draft of the Sustainability Framework Plan and the identification of energy and sustainability strategies for several upcoming projects. Download the press release. W. Cecil Steward was invited to the Meeting of the Minds Conference in New York in early June, along with other Innovators who are scaling-up practical urban innovations in infrastructure, technology, energy, transport, water, and finance to build more livable cities. Meeting of the Minds 2009 is an invitation-only leadership summit. It brings together more than 130 policy-makers, opinion-shapers and thought-leaders from commercial, non-profit and public sector organizations. Each year’s Meeting of the Minds builds on the last year’s successes. 2009 focused on the connections between disparate challenges facing cities. As they undertake complex projects, city leaders are finding new ways to “connect the dots.” Whatever their city’s shape or size, whether rich or poor, urban leaders are busy making their communities more sustainable. This Meeting provides a platform to understand better what works and why. To learn more about this leadership summit, visit the website. W. Cecil Steward was a featured speaker at the Sustainable City and Creativity: Promoting Creative Urban Initiatives conference in Naples in September 2008. Sponsored by the Università degli Studi di Napoli Federico II, Polo delle Scienze e delle Tecnologie, Dipartimento di Conservazione dei Beni Architettonici ed Ambientali, and the Scuola di Dottorato di Architettura and Laboratory of Research on City, Creativity, Sustainability, the three-day conference featured speakers from around the world, speaking on creativity, cities and sustainability. You can download a copy of the conference flyer here and a copy of the speakers and sessions here.